Publisher: Minotaur Books, St. Martin's, New York, New York, U.S.A.
Because 1893 is a tough year in Montana, any job is a good job. When Big Red and Old Red Amlingmeyer sign on as ranch hands at the secretive Bar VR cattle spread, they're not expecting much more than hard work, bad pay, and a comfortable campfire around which they can enjoy their favorite pastime: scouring Harper's Weekly for stories about the famous Sherlock Holmes. When the boys come across a dead body that looks a whole lot like the leftovers of an unfortunate encounter with a cattle stampede, Old Red sees the perfect opportunity to employ his Holmes-inspired deducifyin' skills. Putting his ranch work squarely on the back burner, he sets out to solve the case. Big Red, like it or not (and mostly he does not), is along for the wild ride in this clever, compelling, and completely one-of-a-kind mystery. Steve Hockensmith writes a monthly column for Alfred Hitchcock's Mystery Magazine, and stories featuring Big Red and Old Red appear regularly in Ellery Queen's Mystery Magazine. He has been a finalist for the Shamus Award for his short-story writing. 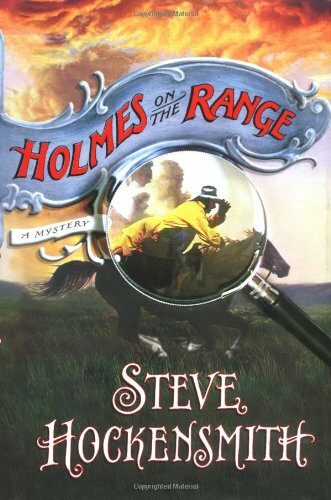 Holmes on the Range is his first novel.